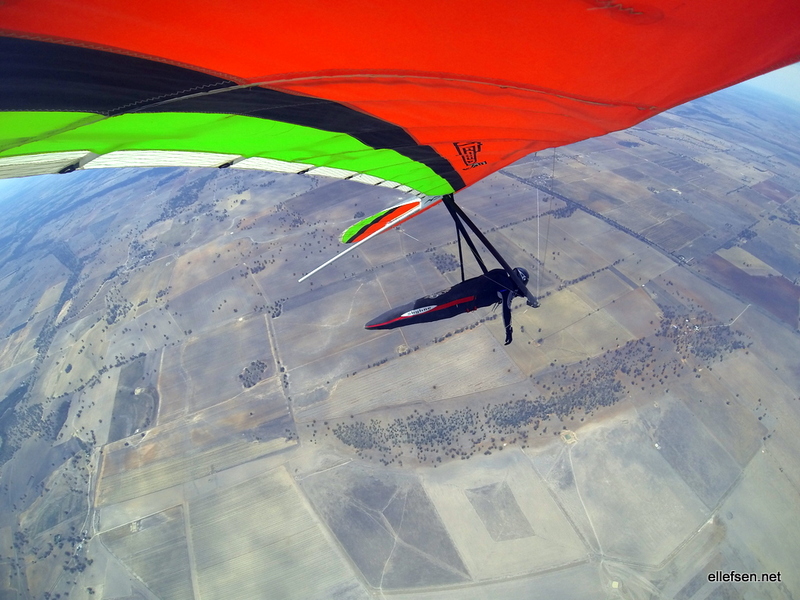 Yesterday was my first hangglider flight since Arizona in September, getting hooked in to the towline behind the dragonfly, go go go, 3 minutes later I release into a huge thermal that average over 5 m/s and go straight up to 2800 meters. How good is Forbes? The team here this year are the veterans Olav Opsanger, Olav Lien Olsen and me, Thomas Lindal who was here last year, and Erland Åmot as freshman here for the first time. Since we had one free spot in the car we also have the Dutch pilot Gijs with us for retreives. The first days here have been good flying, today saw a bit of overcast with cirrus and a bit more wind, but conditions were quite rough and strong in some parts. We set a task today, but it was into the shade so some of us turned back, while Olav Lien Olsen completed it and Erland did 80%. Thomas was attacked by a wedge-tailed eagle today, the eagle ripped his nosecone off the glider, making it “interesting” to fly, but he managed to land safely without any major issues. The forecast for the first few comp days is not great, it’s raining and lightning outside as I write this, but there is a good chance we can fly tomorrow if the more positive weather forecasts are accurate.